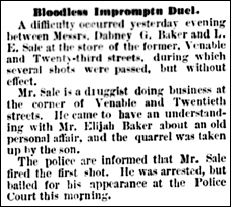 A difficulty occurred yesterday evening between Messrs. Dabney G. Baker and L. E. Sale at the store of the former …, during which several shots were passed, but without effect. Mr. Sale is a druggist … He came to have an understanding with Mr. Elijah Baker about an old personal affair, and the quarrel was taken up by the son. Great question, and the answer starts by understanding what a bill is in the language of the law. So, in a criminal case, the formal written set of charges against a person — the complaint — would be a bill. But when it comes to serious charges here in the United States, and throughout most of the countries with a common law tradition (harking back to the old English law), a prosecutor can’t simply file a charge and force a defendant to come to court and defend himself. Now, this grand jury review of the evidence was never intended to be simply a rubber stamp. The grand jurors were allowed to, and often did, find that the evidence just wasn’t enough. So the grand jury had two choices. It could find that there was enough evidence to conclude that there was probable cause that (1) a crime had been committed and (2) this defendant was the one who committed it, or it could find that there wasn’t enough evidence of one or both of those facts. So the Richmond city grand jury, in this case, found there was enough evidence that Luther E. Sale had committed two misdemeanors to approve the formal charges and make him stand trial. And where, you may ask, is the rest of the story? And the Library of Virginia has all kinds of holdings of Richmond city court records readily available on microfilm, even for inter-library loan.